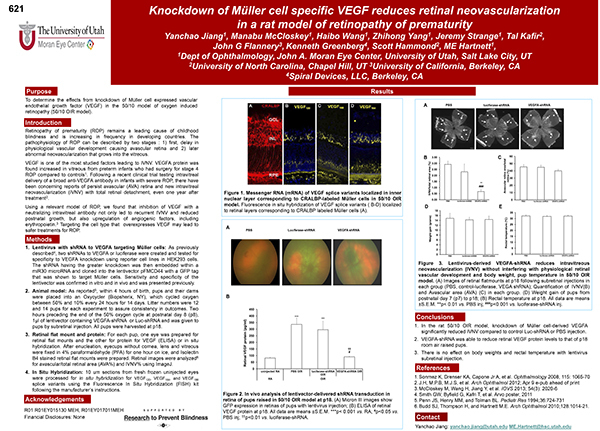 This abstract was presented today at the 2014 Association for Research in Vision and Opthalmology (ARVO) meetings in Orlando, Florida by Haibo Wang, Yanchao Jiang and M. Elizabeth Hartnett. 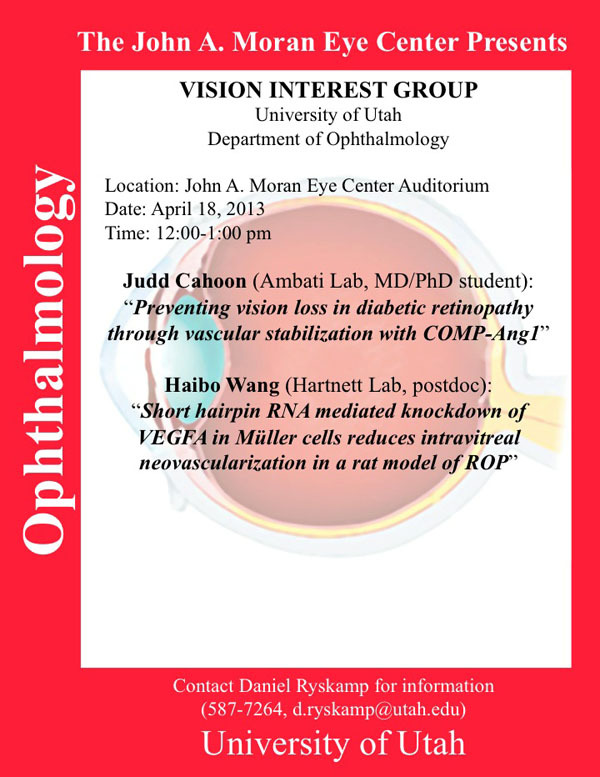 Dept of Ophthalmology, John A. Moran Eye Center, The University of Utah-Salt Lake City. 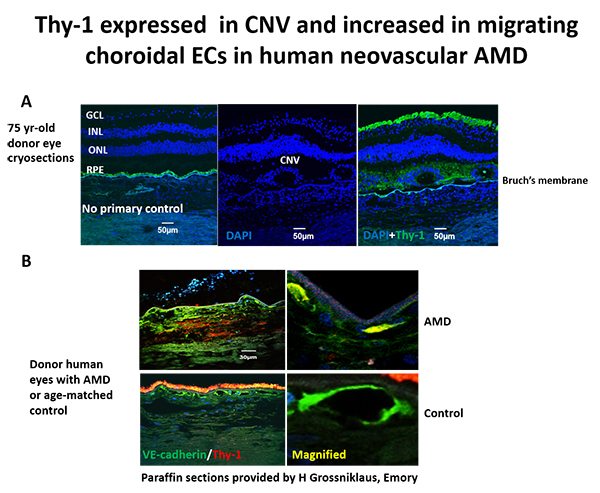 Purpose: Choroidal endothelial cell (CEC) activation and migration precede the development of choroidal neovascularization in neovascular AMD. Thy-1 is a cell surface protein expressed on different cells, including neurons and endothelial cells. As a glycosylphosphatidylinositol (GPI)-anchored glycoprotein, Thy-1 is located in lipid raft microdomains within the cell membrane, which brings Thy-1 into proximity of signaling molecules including cytoplasmic tyrosine kinases that can modulate adhesive and migratory events. 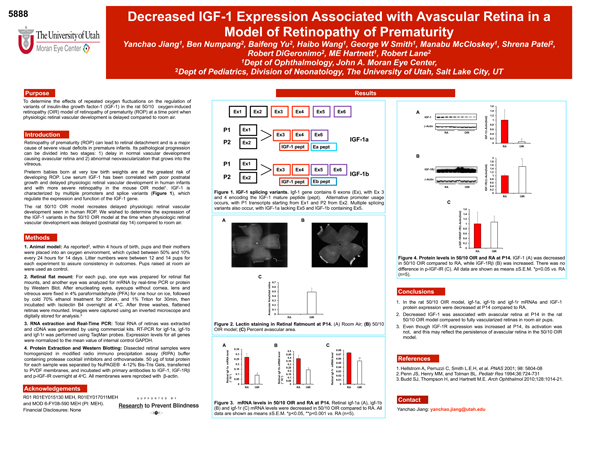 In the retina, Thy-1 is well known as a retinal ganglion cell marker. Given the possibility that Thy-1 might be expressed in CECs, we addressed the hypothesis that upregulated Thy-1 in CECs by age-related stresses contributes to CEC migration. Methods: Western blots of Thy-1 were determined in retinal pigment epithelial cells (RPE) and CECs. 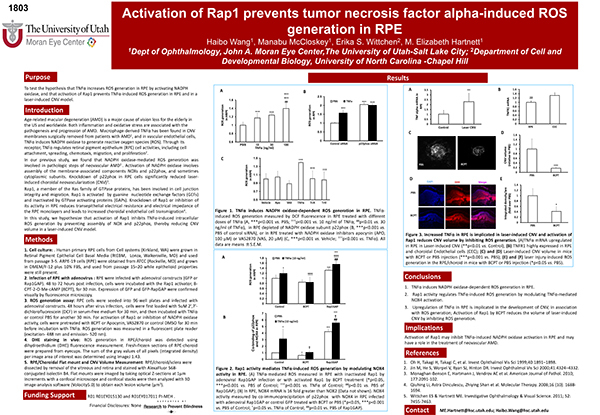 By real time quantitative PCR, Thy-1 mRNA was measured in CECs treated with vascular endothelial growth factor (VEGF) (20 ng/ml), CCL11 (100 ng/ml) or PBS for 24 hours, or in RPE/choroids from young (<40 yrs) and old (>60 yrs) donor eyes. Immunohistochemistry of Thy-1 was performed in posterior globe sections of human retina/RPE/choroids in the maculas of young and old donor eyes with or without AMD. Colabeling with VE-cadherin was used to identify CECs. CECs transfected with Thy-1 siRNA or control siRNA were stimulated with VEGF, and CEC migration and phosphorylation of VEGF receptor 2 (VEGFR2) were measured. Statistics were performed using ANOVA. Results: Thy-1was highly expressed in CECs but not in RPE. 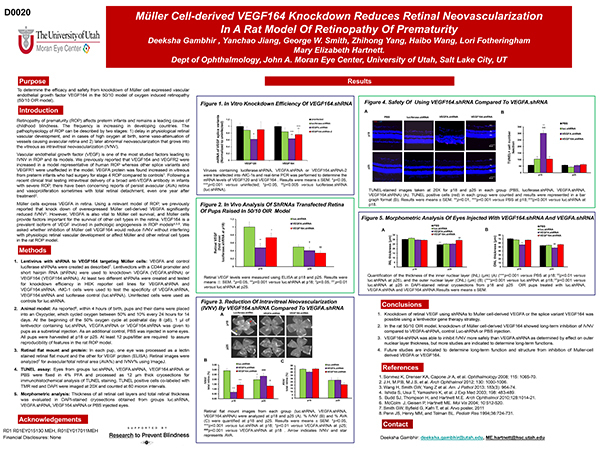 Thy-1 staining was not only detected in the retinal ganglion cell layer, but also in the choroid, and colocalized to a greater extent with VE-cadherin labeled CECs in sections from donors with AMD compared to age-matched controls without AMD. Thy-1 mRNA was significantly increased in CECs treated with VEGF or CCL11 (p<0.05 vs. PBS) and greater in RPE/choroids from aged donor eyes (p<0.001 vs. young). Knockdown of Thy-1 in CECs by siRNA transfection significantly inhibited VEGF-induced CEC migration (p<0.001) and VEGFR2 activation. Conclusions: Thy-1is expressed in CECs and its expression is upregulated by stresses associated with neovascular AMD, including elderly age and increased VEGF. Upregulated Thy-1 in CECs contributes to VEGF-induced VEGFR2 activation and CEC migration. Future studies into the potential role of Thy-1 in neovascular AMD are being considered. 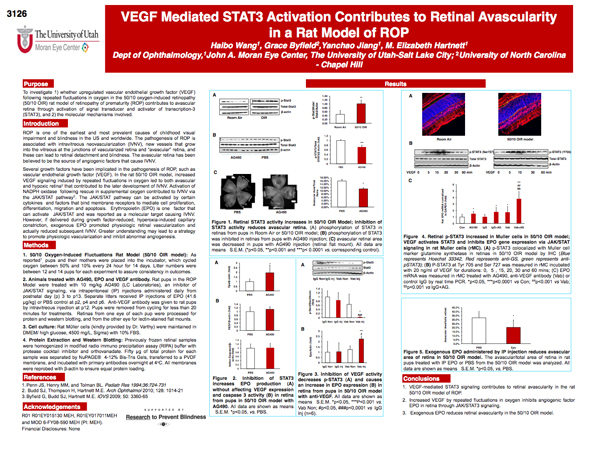 This abstract was presented today at the 2014 Association for Research in Vision and Opthalmology (ARVO) meetings in Orlando, Florida by Deeksha Gambhir, Yanchao Jiang, George W. Smith, Zhihong Yang, Haibo Wang, Lori Fotheringham and M. Elizabeth Hartnett. 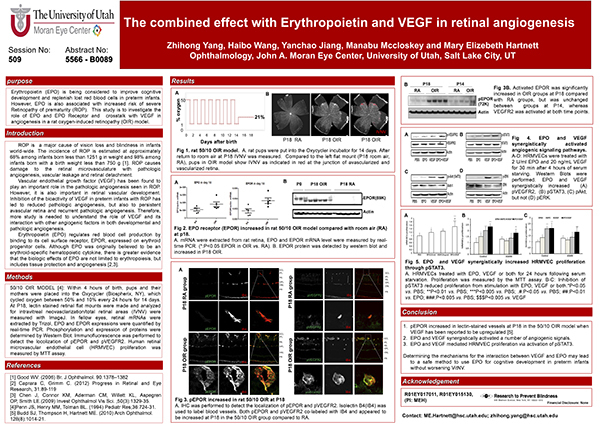 Presented today at the Association for Research in Vision and Opthalmology (ARVO) meetings in Ft. Lauderdale, Florida by Haibo Wang, Erika S Wittchen, Dallas Shi, Dean Y Li and M. Elizabeth Hartnett. 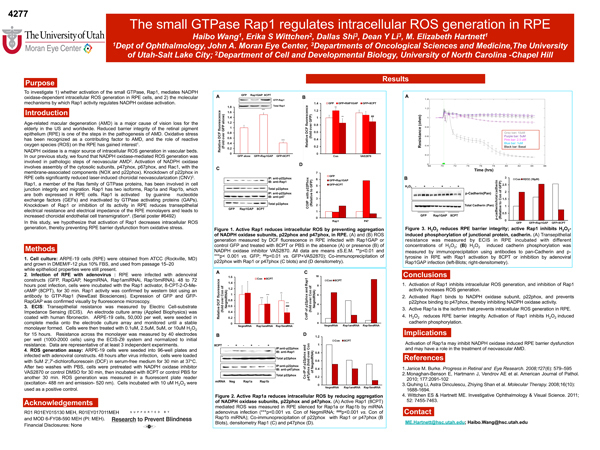 Full size poster can be seen here.